I started with Modern as my first format. My deck list was a lot like yours, huge CMC creatures and tons of 1 ofs. So a good place to start is to ask yourself, how do I want my deck to win? Once you figure out what the main way(s) your deck will win, then you can focus your game plan on making that happen. You really want consistency in your deck. Try picking cards as 4 ofs instead of singletons. If you wouldn't want 4 copies of a card in your deck then it probably isn't worth running at all. (Please note this is only a beginner strategy to get you started and later in your career of magic this logic will no longer imply.) 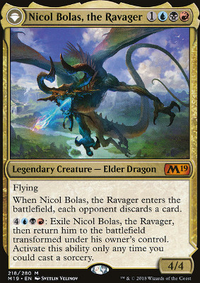 So to give yo a real world example: because you have a lot of big converted cost dinos, a card like Llanowar Elves is a card you would want 4 of. It helps your strategy by enabling ramp for big Dinos to come into play earlier. Pick your wincon. In your case Charging Monstrosaur or Demanding Dragon might be a good choice. I could see Aggressive Mammoth working as well. So once you have how you're going to win, you need to pick cards that will help you enact that game plan. So if you picked Charging Monstrosaur then a play set of Otepec Huntmaster could be in order. Lastly you'll need some form of interaction. Almost every deck in modern will have some form of interaction. You don't have to completely stop the opponent, just slow their plans enough for your plan to happen. A good choice for your deck would be Lightning Bolt but in your case Lightning Strike could work as a budget replacement. At high levels the difference in mana cost is huge but as someone new, it'll do just fine. Hey, you asked my opinion. One time I read about consistence of decks composition. There is a lot of single copy cards, this make the game very unpredictible for yourself, lack of a solid strategy. My advice is to focus in more 3 and 4 copies of a single card and lass 1 and 2. 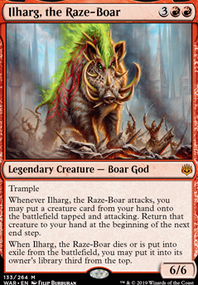 But is a great selection o of card for a Gruul deck. Llanowar Elves , keep 4 of it. Dire Fleet Daredevil is a good card, but situational, 2 of then if you want to keep. Thorn Lieutenant is a good creature, good effect. But more oriented for a token deck, i would not put in this deck. Captain Lannery Storm takeout, have no synergy. Deathgorge Scavenger same as above. Gruul Spellbreaker best creature Gruul, 4 of them. Reclamation Sage and Thrashing Brontodon have the same objective. If I would choose Thrashing Brontodon . But have you see the Cindervines ? Is a good adittion, but I wold keep in the Side. For a enchant/artifact more oriented deck. Well, would use 2 or 3 of them if is that the case. Now the 4 cost I would consider to run few of them, would slowdown to much the deck. Dagger Caster is a good card, but would take it out. 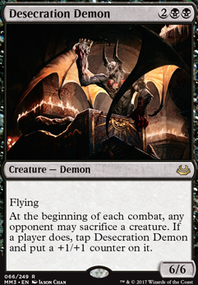 Goreclaw, Terror of Qal Sisma you dont have that much of 4 power or more in the deck, would take out or increse the number Goreclaw for 3 and put more 4 power creatures. But I dont think is the case. Nullhide Ferox Very nice! 2 of Him wold make a great addition. Ripjaw Raptor Good for a draw. 2 of them but the other 4 creatures are better. Vine Mare is a good creature, against black is a unblockeable tank. But same as above, we have better creatures. Charging Monstrosaur I love this guy, I would put 3 of them, if you can. Haste, Trample, maybe 6/6 with riot. Perfect. 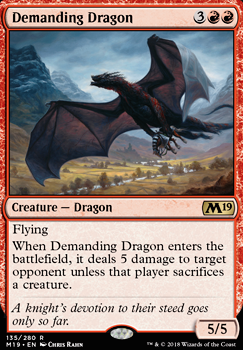 Demanding Dragon lets stay wtih only 3 creatures with 5 cost? Só choose betwew the Mostrosaur ou this little Dragon guy here. 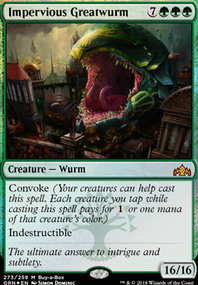 Ravager Wurm 1 is enogh, a nice surprise if you can cast it. Lava Coil Good removal, 3 of them, 3 of Lightning Strike or 3 of Thrash / Threat , they have pretty much the same cost and remove cards. 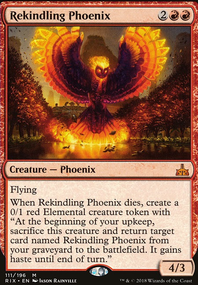 Lava Coil is solid, Lightning Strike is flexible and Thrash / Threat work out with yours creatures power. I would choose one of them. Maybe leave one on side. Act of Treason I dont think that is a good card to the deck. Fight with Fire Great, 2 is a good number for it. can takeout a lot of threats. Response / Resurgence , woith Fight with Fire this is a little unecessary. Have a cheap cost, but is situational. Is a instant, make a little more flexible. If you keep it 3 of them would be nice. Rhythm of the Wild Put 3 of it, please xD. 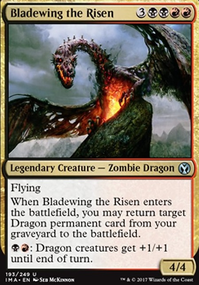 Domri, Chaos Bringer and Vivien Reid . Choose one and keep 2 of it. I wold go with Domri. Loizo on Bolas brawl 0.1? Hi, at first glance the deck looks good but you are missing a few key pieces. If you want to multi : boardwipes and recurrent threats like Cry of the Carnarium Jaya's Immolating Inferno Nezahal, Primal Tide . Hey, against control decks the Demanding Dragon is quite good. It means 5 Damage to the face for an empty board... with Rhythm of the Wild it will have haste for more damage. Against other decks it's a nice tool... for me it feels more useful than the Skarrgan Hellkite .